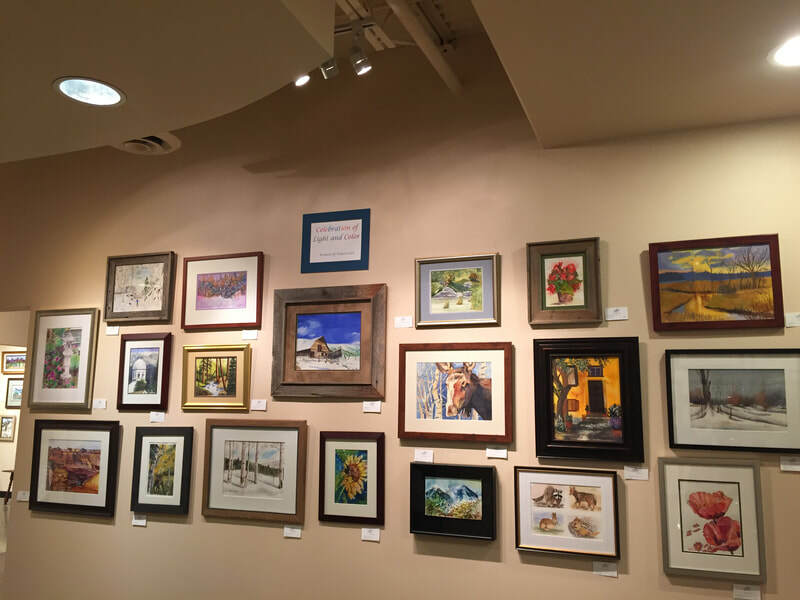 The Women of Watercolor typically produces two exhibits per year; a winter exhibit and a summer exhibit. 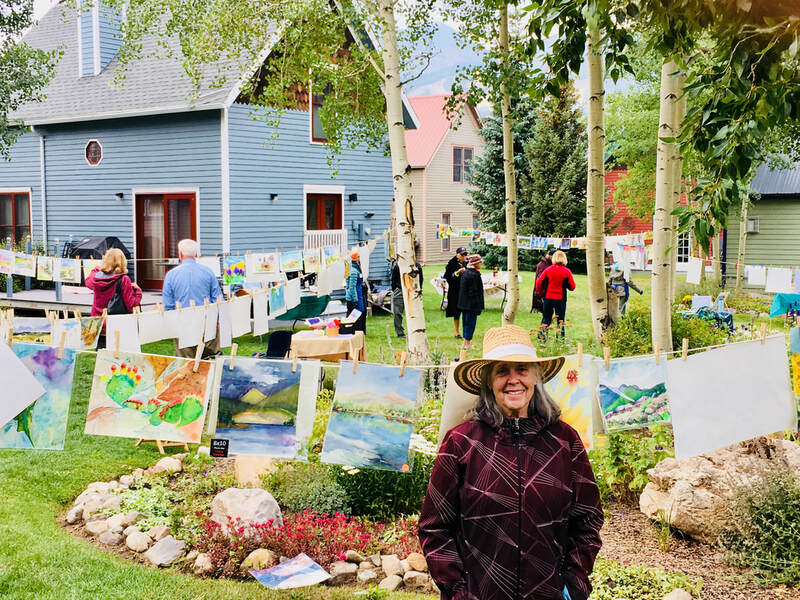 ​In 2018 the winter exhibit took place at the Arts Alive Gallery in Breckenridge and in the summer WOW produced an outdoor "Clothesline Sale" exhibit in Breckenridge. Please check back here in February of 2019 for information about 2019 exhibits. 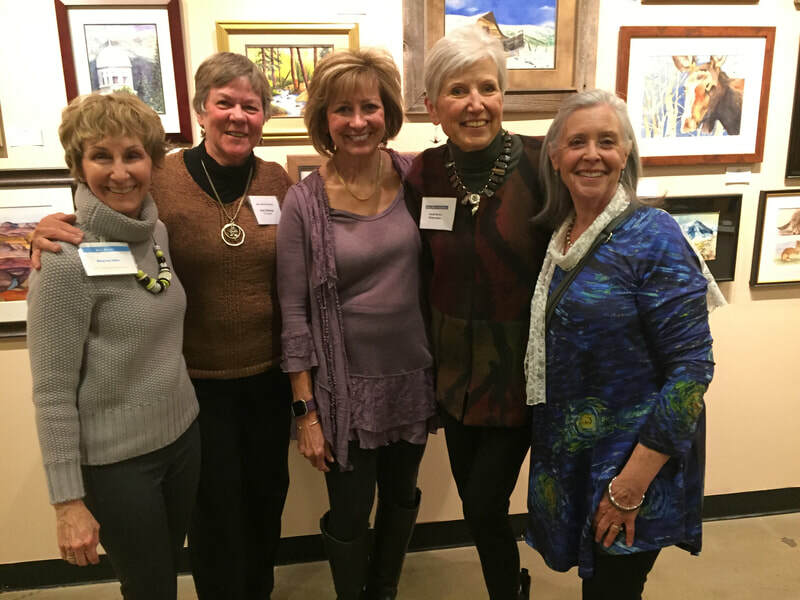 Artists at the 2018 Winter Exhibit at the the Arts Alive Gallery in Breckenridge. 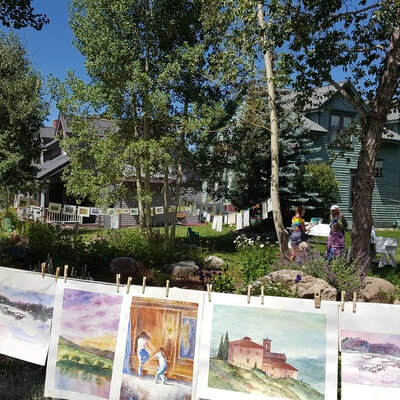 The 2018 Clothesline Sale and Exhibit took place on a beautiful August summer day and drew a lot of visitors! Paintings must be original watercolors and not a copy of another artist’s work. Paintings must be “new” to WOW exhibits, meaning they have not been hung in a WOW exhibit before. Paintings must be at least 80 percent watercolor. Frames must be professional looking and clean. Frames can be up to 4 inches wide and should complement the painting. Avoid garish/overdone frames that detract from the painting and exhibit. Mats can be any color and width and should complement the painting. Frame backings must be of foam core, a backer board or covered with paper. Plexiglas is allowed but must be at least 1/8 inch thick. Picture hanging wire should be securely attached to the back of the frame (no alligator teeth hangers, please). Bin art may be original art or copies of your original art. Bin art need not be “new” to a WOW exhibit. Art for the bins should be clearly labeled, backed, and wrapped in clear bags or cellophane. Include price, artist information and whether the piece is the original or a copy. ​Paintings not meeting these standards will not be hung. WOW reserves the right to refuse any artworks deemed unsuitable for the venue. The Gallery Hanging Committee will have full and exclusive responsibility for such decisions, including number and quality of paintings. Questions may be directed in advance to the Gallery Hanging Committee. 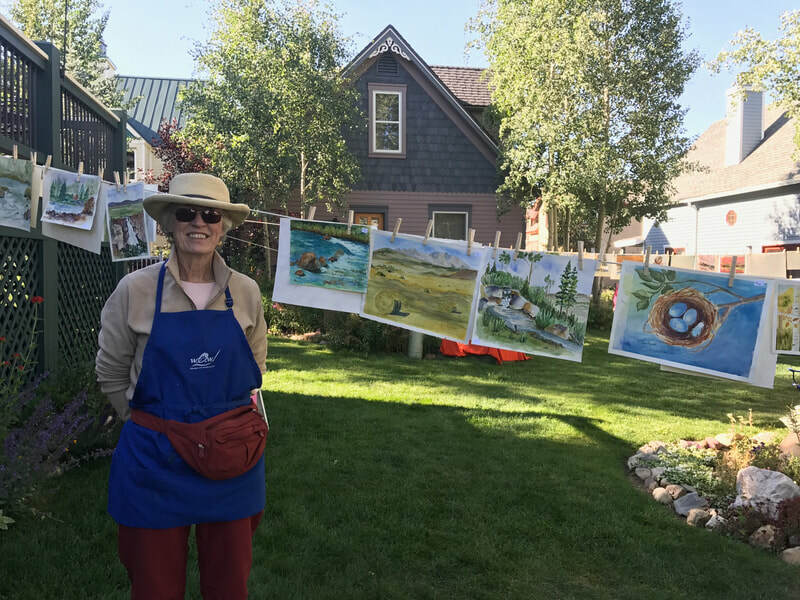 Women of Watercolor is not responsible for loss, theft, or damage. Each painter must deliver and pick up her own paintings or must arrange for someone to do so on her behalf. Be sure to put identifying information on the back of each painting: Name, title of piece, phone, price, size, and medium. Are all 3 values represented in unequal proportions (papa, mama, baby)? Is there linkage between light values and linkage between dark values? Is the subject well place on the paper, cropped correctly? Are there awkward elements, like elements that cut the painting in half, arrows in corners, tangents, empty areas, distractions, etc.? Does painting read quickly or are there parts viewer doesn’t understand? Is the viewer led through the painting? Is there a clear and consistent light source? Are there light or dark pathways? Is there a color temperature dominance? Are there color temperature shifts in passage? Are there warm & cool colors? Is there a mix of hard and soft edges?